Known by everyone who is serious about antiques, and almost unknown to everyone else, the material ormolu – also known as gilt bronze or bronze dorée – is the bedrock of European decorative arts in the 18th and 19th Centuries. A sturdy material made from gold-coated bronze, ormolu is extremely practical, and yet utterly splendid. It is for these reasons that ormolu features in many of the most important pieces of furniture of the period. Its beautiful colouring and lustrous sheen make it a fantastic choice for a bold, glamorous interior. Plus, it has the beautiful, precious quality of gold with neither the vast expense of solid gold nor the glossy, cheap feel of other gold substitutes. It's for these reasons that it was so universally favoured by the artisans of the 18th and 19th Centuries, in professions as diverse as clockmaking, ceramics, cabinetmaking, sculpture, and even bookbinding. There is often confusion today about what ormolu actually is. Most commonly, ormolu is used to refer to a bronze object which has been covered around its entire surface with gold, typically 18 or 24 karat. This is why it’s also called gilt bronze, or in French, bronze dorée. Strictly speaking, however, the word ormolu refers both to the technique for applying gold to a metal (normally bronze) as well as to the finished object, gilt bronze. Indeed, the word ormolu comes from the French or moulu, which means ground or powdered gold: the form the gold takes before it is applied to the metal. It is this gold element – the or moulu – which makes ormolu what it is. Why is ormolu so valuable? Gold is one of the most (if not the most) valuable materials known to man. Since the dawn of civilization, gold has been used all around the world as a form of currency. Your wealth was measured in how much gold you possessed. It was no surprise, then, that people coveted precious items made from the material. But pure gold was too soft to make into large pieces, and even for the very richest people in history, it was sometimes simply too expensive. Ormolu was the perfect solution to this problem: by taking a cheaper and harder metal, bronze, and coating it with gold, craftsmen could make objects appear to have been made entirely from gold, but obviously without the vast expense that this would incur. That said, although ormolu wasn't as expensive as gold, it wasn't cheap either. Ormolu was a luxury material, made by only the most skilled craftsmen, that only the richest could afford. 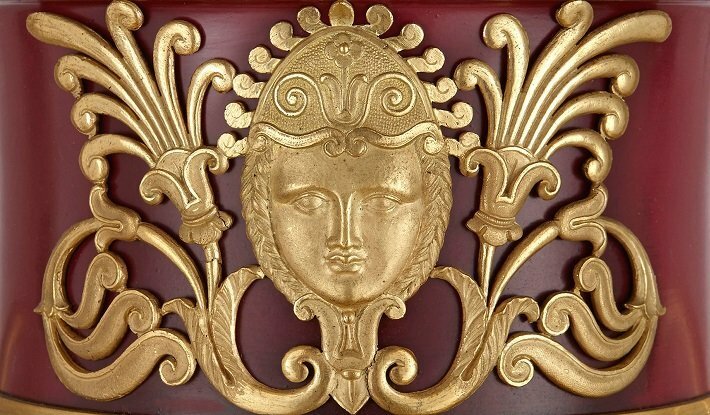 Far from being simply a cheaper alternative to gold, ormolu is an art form in its own right. The process of casting the bronze and gilding it is a time-consuming, painstaking process which requires skill and dexterity. Ormolu mounts have sculptural or architectural qualities: that is, they often imitate sculptures (figures, flora, fauna) or they imitate architectural elements (columns, balustrades, frames, supports). In this way, ormolu is (perhaps paradoxically) a decorative element at the same time as being fundamental to the design of a piece. It is at once ornament and structure. The process of making ormolu is an arduous one, and involves several, complex stages of production. First of all, the craftsman makes the bronze object ready for gilding. In the 18th and 19th Centuries, bronze was most often cast using what’s known as the ‘lost wax’ method. In short, this involves creating a wax model of the object, fitting it into a plaster and rubber case, and then heating it so that the wax melts away. Molten bronze is poured into the mould and then it is left to set. After the bronze has cooled and been cast, the gilder gets to work. 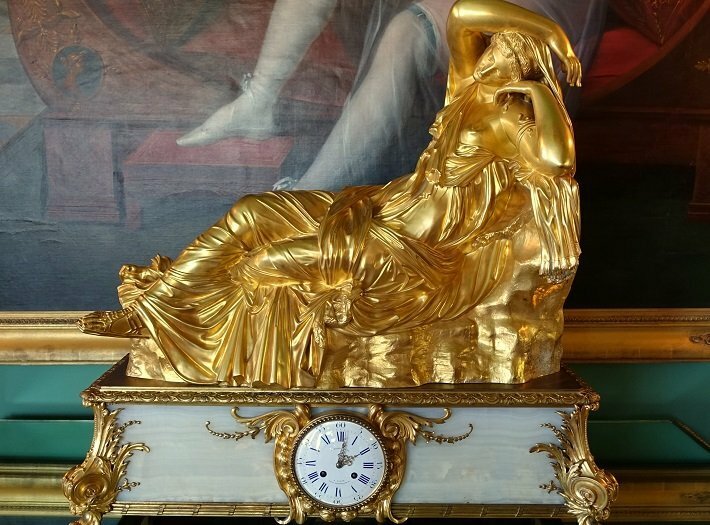 In the production of antique furniture, clocks and sculpture, there were commonly two different techniques for applying gold to bronze. The less common, and simpler, technique was to glue and hammer gold foil or gold leaf onto the surface of the bronze. This method fell out of favour when more complex techniques were developed, since it was much harder in this method to create the kind of fine detailing that became so important to European furniture in the 18th and 19th Centuries. The more common method used in the period was what’s known as ‘mercury gilding’, or (more excitingly) ‘fire gilding’. This method was what was most often associated with ormolu, although it’s really an ancient technique dating as far back as the 3rd Century BC. Fire gilding involves applying a solution of mercuric nitrate to the bronze, followed by a mixture of mercury and ground gold powder known as an amalgam. The bronze is then heated so that the mercury, which has a lower boiling point, evaporates, leaving behind the gold powder which has fused onto the surface of the bronze. This method, although widely practiced all over Europe, was extremely dangerous, due to the harmful mercury fumes produced by the process. Gilders often did not survive past the age of 40. 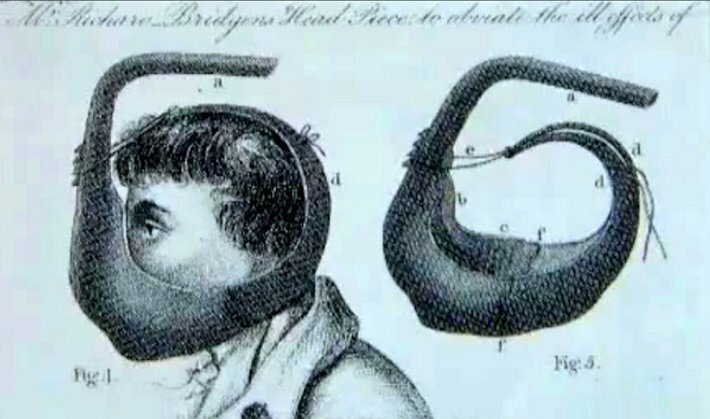 A model of the protective mask worn by gilders to stop them breathing the poisonous mercury fumes. The mask was designed so that its wearer would breathe the air behind him, rather than the fumes in front of him. As you can imagine, it wasn't very effective. Interestingly, France – the centre of most ormolu production in the 19th Century – actually outlawed the use of mercury in 1830 because of the danger involved. And yet, the law was so badly enforced that mercury gilding remained the main method of creating ormolu well into the 20th Century. Nowadays, the process of gilding bronze involves a complicated electrochemical procedure known as electroplating, or gold plating. This was a method which was developed mid-way through the 19th Century but was not used widely until the 20th. The process of gilding is itself an ancient one, dating back thousands of years. The earliest recorded examples of gilt objects date to Ancient Egypt (around 2000-1000 BC). It’s harder, however, to pinpoint the exact origins of ormolu, or gilt bronze. Some of the earliest examples of ornamental gilt bronze – and especially the earliest examples of gilt bronze made using mercury gilding – come from China. These date as far back as the 3rd Century BC. 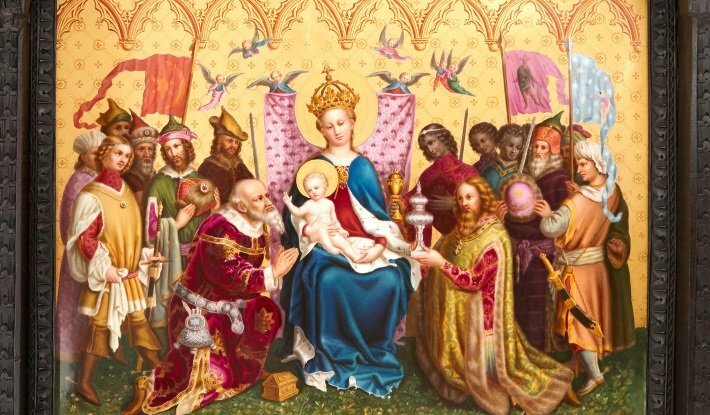 At the same time in Europe, and throughout the Middle Ages, gilding was applied mostly to silver rather than bronze. This was known as silver-gilt or vermeil. There were some fine pieces of art created using gilt bronze throughout the Renaissance and later Middle Ages, like Italian Renaissance artist Lorenzo Ghiberti’s 15th Century design for the entrance to the Baptistery of San Giovanni in Florence. 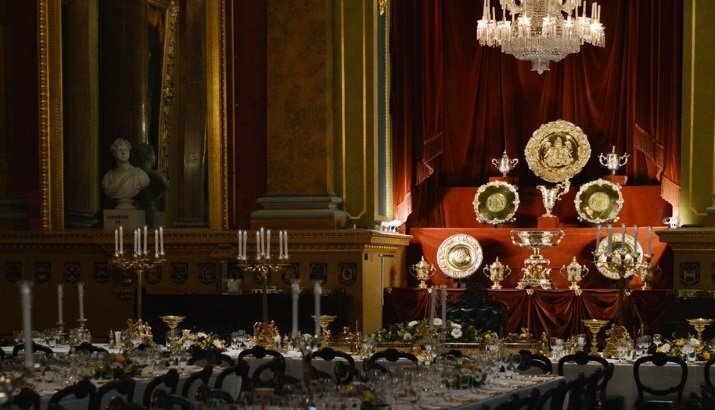 However, it wasn’t until the 17th Century in France that ormolu started to find widespread use – and it is French furniture produced in the 18th and 19th Centuries that we most commonly associate with ormolu. Bronze mounts on furniture were commonly used in Europe throughout the Middle Ages and beyond, although they were not gilded and their role was primarily functional rather than decorative. Bronze sabots (or clogs, covering the feet) would, for example, protect a table’s feet from water and rotting; bronze escutcheons around a cabinet’s keyhole would prevent the veneer from being scratched by the key. It was in the 17th Century that the nature and role of these bronze elements changed dramatically, thanks to an important development in the arts: the European Baroque. The European Baroque period (17th and early 18th Centuries) was the first Great Age of the ébéniste. Cabinetmakers achieved great fame making exquisite, extravagant luxury furniture for a rich clientele increasingly concerned with displaying their wealth. Ormolu was a natural material for these aristocrats to use to decorate their vast palaces, thanks to its brilliant sheen. Where previously their furniture had contained simple bronze elements, in this new age they commissioned larger and more elaborate ormolu mounts. Bronze mounts on a piece of furniture were no longer simply practical, they were an integral part of its artistic qualities. 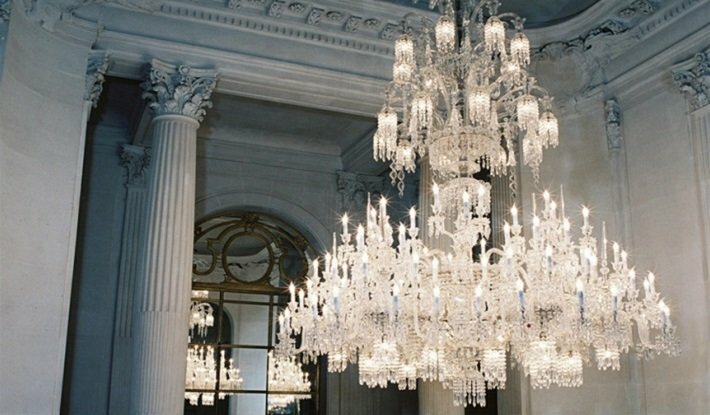 Additionally, ormolu in the Baroque found widespread use in the production of candelabra and chandeliers. Its lustrous colour was a perfect choice in lighting fixtures, as the gold surface would reflect the light to produce a glimmering, sparkling effect. In the same way, gilt bronze became the obvious choice for mirror frames in the Baroque. Perhaps no one person spoke to the opulent spirit of the Baroque more than the French King Louis XIV (reigned 1643-1715). He is thought to have said in 1663 that ‘there is nothing that indicates more clearly the magnificence of great princes than their superb palaces and their precious furniture’. The magnificence of French furniture in the Louis XIV period was summed up in the work of one particularly famous ébéniste, Andre-Charles Boulle (1642-1732), who, among other innovations, popularised the use of extravagant gilt bronze mounts on his furniture. As the Baroque period moved in to the Rococo – or Late Baroque – of the 18th Century, ormolu was again fundamental to the new joyous and flamboyant style of design and interior decoration. 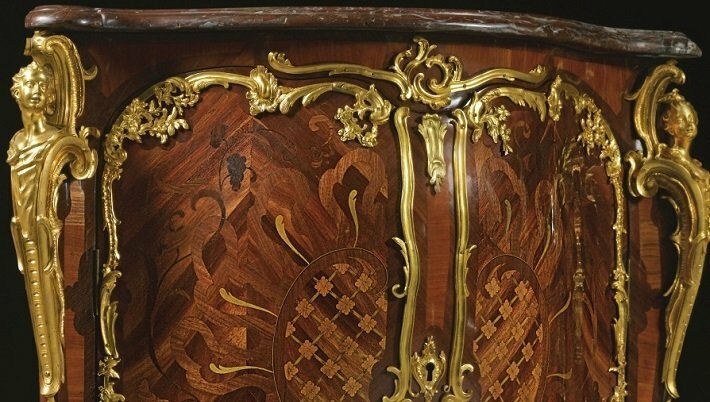 The Rococo style of furniture favoured curving, serpentine shapes: ormolu mounts were used to emphasise these curved, scrolling outlines, as well as decorative mounts in their own right. The famous motifs of the period – shells, leaves, waves and flowers – were often found as ormolu mounts on pieces. One of the most important makers of gilt bronze in the mid-18th Century Rococo period was the French artist Jacques Caffieri, who specialised in bronze mounts for furniture, clocks and chandeliers. He produced many of the decorative ormolu mounts for the Palace of Versailles. Caffieri's success was in some small part due to his having purchased a royal grant which allowed him the unusual privilege of being allowed to gild bronze as well as cast it. This was normally forbidden at the time. Other famous craftsmen who produced fantastic, Rococo-style ormolu included bronziers Jean-Claude Duplessis (1699-1774) and François Rémond (c. 1747-1812), gilder Pierre Gouthière (1732-1813), and clock decorator Jean-Joseph de Saint-Germain (1719-1791). Again, these men not only made ormolu fittings for furniture, but also made fantastic candelabra, chandeliers, clock decorations, mirrors and even fireplaces. It was also in this period that the famed porcelain factories at Sevres and Meissen started to experiment with adding ormolu mounts to their ceramics. The experiment was so successful, and the pieces so beautiful, that it would later become de rigeur for Sevres vases to be fitted with exquisite ormolu mounts. 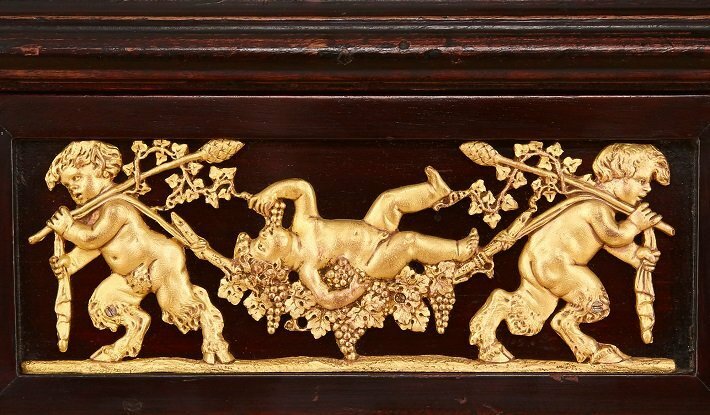 By the time that the Neoclassical Age arrived in the later part of the 18th Century, ormolu was so valuable in France and the rest of Europe that it had started to cause tensions between rival craftsmen. The guild system was a medieval institution, designed to divide craft labour between different workers. In France, the production of ormolu was split between two guilds, the fondeurs-ciseleurs (bronze founders and chasers), and the ciseleurs-doreurs (chasers and gilders). It was because of this guild system that the famous bronze casters of the 18th Century were not allowed to gild their own objects, and gilders were not allowed to make bronze. This is why it was unusual, for example, that Caffieri was responsible for both casting bronze and gilding it. The extremely high demand for ormolu by the later part of the 18th Century had meant that these two guilds started to compete. Tensions between them were eventually alleviated when the French King Louis XVI combined them in 1776. What this meant was that ormolu made in the new Louis XVI style – the French version of Neoclassicism – took on a completely different character. Craftsmen were, from 1776, responsible for all the stages in producing ormolu, which allowed them closer creative control over the finished product. Some of the finest and most exquisitely cast and chased ormolu was produced during the Neoclassical period. Whereas in the Rococo ormolu’s purpose was to emphasise the shape of a piece of furniture, in the Neoclassical Age ormolu was designed as the stand-out feature of a piece. 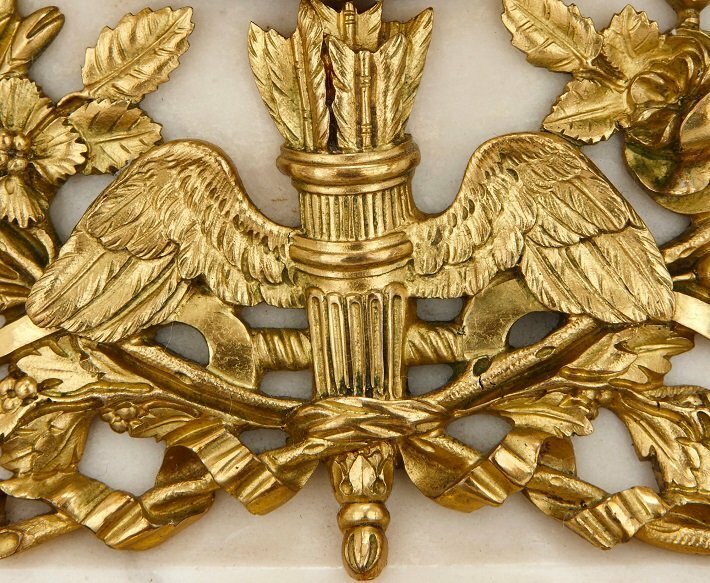 Neoclassical ormolu mounts were extremely intricate, finely-cast pieces, typically taking the form of classical figures and motifs, including tied ribbons, garlands and draperies. Moreover, it was during this period that the most famous English ormolu pieces were made. English manufacturer Matthew Boulton (1728-1809) experimented with making ormolu vases in the 1760s; and in the early 19th Century Benjamin Lewis Vulliamy (1780-1854) achieved wide acclaim for his beautiful Neoclassical style clocks and was later appointed clockmaker to the Crown. The use of ormolu in the Neoclassical style reached its peak at the start of the 19th Century. This was the period in France of the Napoleonic Empire, a short-lived age of triumphalism, luxury and splendour in the decorative arts. Ormolu mounts on furniture were still used in abundance, but perhaps the greatest decorative innovation in the Empire period was the sudden growth in production of elaborate mantel clocks. These clocks were Neoclassical in design, and most of them were adorned with sculptured figures inspired by Classical figures and mythology. 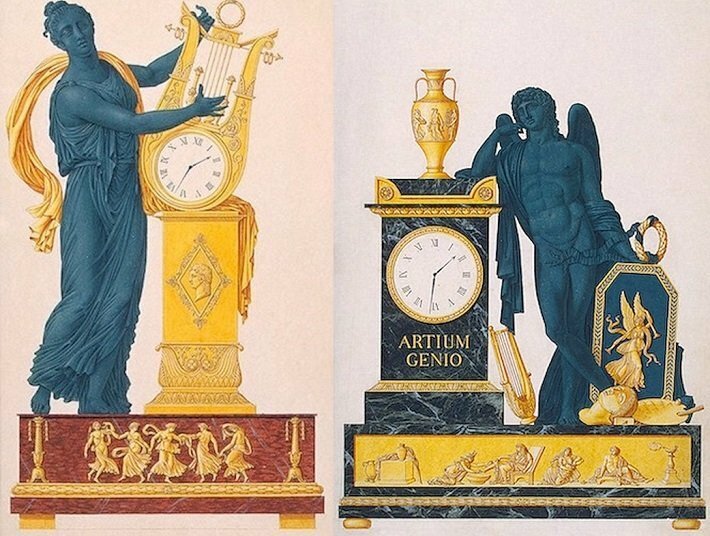 These were known as figural clocks, and while some took Classical myths and stories as their inspiration, others were direct copies of Classical sculptures. Creating these figures, often in miniature, was no mean feat and was testament to the ingenuity of clockmakers of the period. Ormolu could be found on these clocks in abundance, and there are many exquisite Empire style mantel clocks made only from ormolu. Perhaps the most famous and skilled clock decorator of the Empire period was Pierre Phillippe Thomire (1751-1843), who received commissions from France’s elite, as well as from the Emperor Napoleon himself. Other distinguished ormolu makers of the period included Claude Galle (1759-1815) and André-Antoine Ravrio (1759-1814), both renowned for their fine Empire style ormolu works, many of which can now be found important collections around the world. As the 19th Century progressed, ormolu remained the predominant material in the production of luxury furniture, lighting, and clocks. The later 19th Century saw a number of revivalist styles emerge, including revivals of the Rococo and Neoclassicism, and in each of these the craftsmen followed in the tradition of their 18th Century predecessors but with the desire to make ever more exquisite and elaborate gilt bronze pieces. Particularly notable in this period were the makers Alfred Beurdeley (1847-1919), Francois Linke (1855-1946), and Ferdinand Barbedienne (1810-1892), all of whom have come to be associated with their beautiful ormolu creations. Barbedienne ormolu mantel clock in the John and Mable Ringling Museum of Art, Florida. Note the sumptuous combination of the Empire style with the scrolling shapes of the Rococo. This beautiful combination of styles was something which Barbedienne was widely acclaimed. 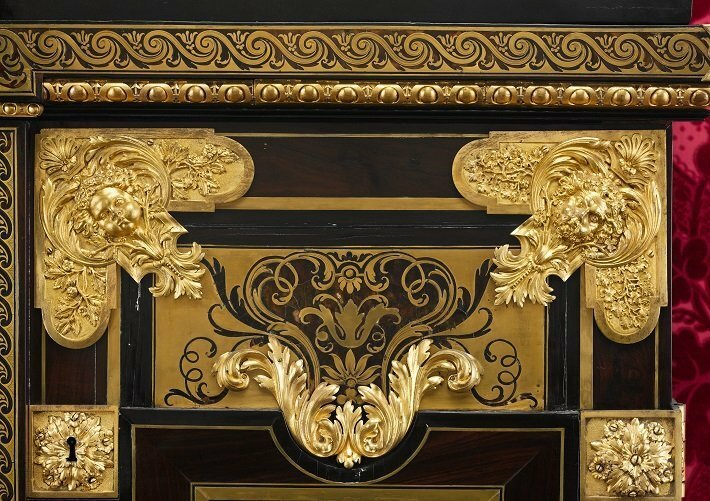 Maison Beurdeley, the company which Alfred inherited from his father, were particularly known for their pioneering use of opulent materials, and produced their own ormolu for their furniture. Linke, however, was well-known for his collaboration with the famed sculptor Léon Méssagé (1842-1901) to produce the exquisite sculptural mounts found on his furniture. 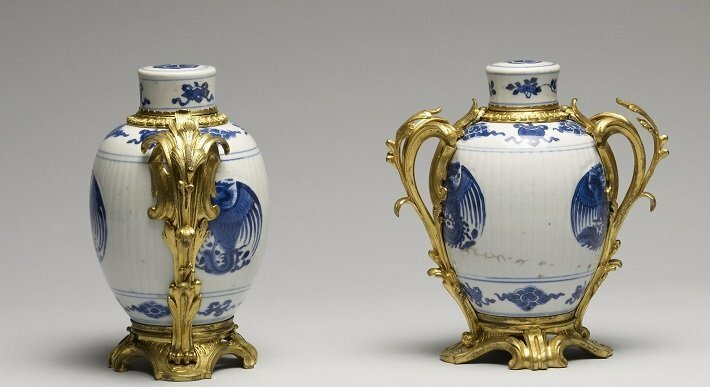 And Sevres style porcelain vases continued to be fitted with luxurious ormolu elements. It’s also worth noting that, throughout the Age of Ormolu in the 18th and 19th Centuries, Asian artworks, and in particular Chinese ceramics, were especially fashionable among wealthy Europeans. These ceramics were shipped from China to Europe at great expense, such was the demand for them among Europe's elite. To enhance the luxury status of these pieces, and to signify their quality and beauty, many of Europe's collectors had them mounted with French ormolu. European taste had combined with Chinese craftsmanship to produce some truly stunning pieces. Ormolu continued to find use throughout the rich design style of the Art Nouveau period, in Art Deco antiques and beyond, although these styles favoured a much less rich and splendid use of ormolu. By the middle decades of the 20th Century, ormolu’s heyday was over. The designers of the period could not match their 18th and 19th Century counterparts in terms of opulence and intricacy, and instead favoured minimalism, functionality and muted tones. 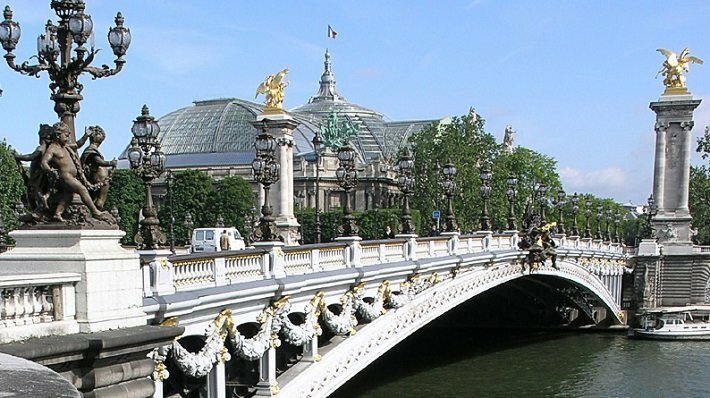 Perhaps the last hurrah of gilt bronze was its incorporation into the design for the Pont Alexandre III in Paris, a masterpiece of opulent design in the Art Nouveau style. The Pont Alexandre III in Paris. Note the gleaming gilt bronze mounts on the bridge. But even though it's rare to find contemporary pieces which use ormolu - in no small part due to the expense involved in making it - ormolu continues to be regarded as precious by those who know and collect antiques. Its firm roots as the foremost decorative material of the 18th and 19th Centuries means that it will always be associated with luxury and quality design. Antique ormolu offers its owners the beauty of good craftsmanship, the splendour of the precious, and, of course, the glamour of gold. World-famous Renaissance sculptor Michelangelo was so impressed by Italian artist Lorenzo Ghiberti's ormolu doors at the entrance to the Baptistery of San Giovanni in Florence, that he likened them to the 'Gates of Paradise' - the name by which they are commonly now known.